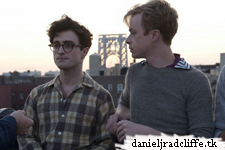 More Radio interviews in which Daniel promotes the UK release of Kill Your Darlings. First off you could have missed Eagle Radio (96.4)'s Adam and Bev Breakfast chat with Daniel. Then there is also Free Radio with Foxy and Giuliano. Daniel called them this morning at 8:15. You can listen to that interview by clicking the link below. I enjoy this interview: I adore listen to him, he's so nice and funny! I want to save this interview on my pc, but I don't be able to do it... "mannaggia"! Which one do you mean? Both are available. the Eagle Radio one via their website. The other via audioboo.fm If I remember it right, but their server is still down at the moment.. The interview FoxyandGiuliano: I clic over and I can hear it, but I can't copy it on my pc; but surely, I'm doing some mistake..! Yesss! After a little "fight" against my ignorance, I grab it with RSS! Thank youuu!